IRDA Claim Settlement Ratio 2017-18 |Best Life Insurance Company in 2018. IRDA’s latest Annual Report published on 9th January 2019 gives all the details on the claim settlement performance of Life Insurance Companies of India. Claim settlement ratio (CSR) is one of the most important statistics of an insurance company. It gives you a fair idea on how much trustworthy the company is. The prime duty of an insurance company is to settle the claims, in a fast and prudent manner and give the insured amount to the nominee of the policyholder, on the occurrence of the insured unfortunate event. Claim settlement ratio is the percentage ratio between the claims settled and the claims received in the period of time. For example, if a company receives 100 claims out of which 90 claims are settled then the claim settlement ratio of the company is 90 %. Claim settlement ratio can be calculated based on the number of policies or on the amount of claim settled. The ratio of the claims settled will give you a clear idea on the satisfied customers of the company. Further to add, the trust of the policyholders in an insurance company is directly related to its Claim Settlement Ratio. Death claim settlement ratio as well as claim rejection ratio of various companies for the year 2017-18, as per IRDA’s published annual report is given below. These four parameters shown here will guide you towards finding out the best life insurance company in India in terms of death claim settlement. Click here to download claim settlement ratio image. Life Insurance Corporation of India, the one and only public sector insurance company in India, once again has set the standards high and emerged as the best company in terms of claim settlement, when all the four parameters were considered. Claim repudiation/rejection ratio of just 0.67% is a commendable achievement. On the other hand, Max Life which topped the claim settlement ratio with 98.26 %, repudiated 4.47% of death claim in terms of percentage of benefit amount of claims. 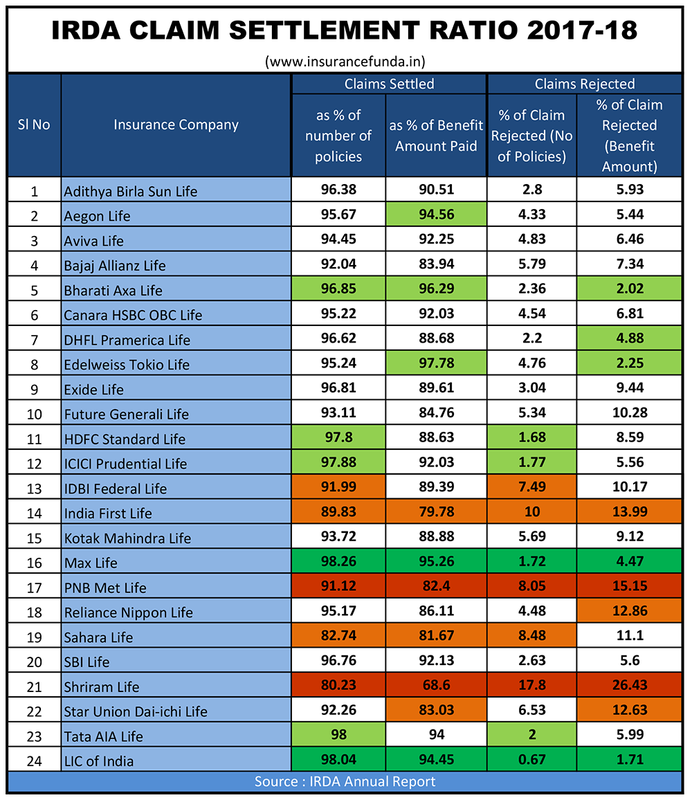 Worst claim settlement performances were from Shriram Life and PNB Met Life. The claim rejection rations were 26.43% and 15.15% respectively. Claim rejection ratio is the ratio between ‘number/amount’ of the claims completely rejected by the company compared to the total ‘number/amount’ of claims. 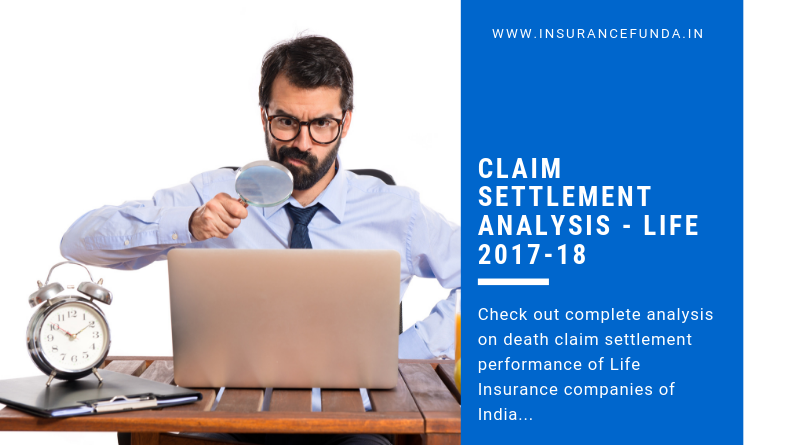 As we have seen claim settlement ratio gives an idea about the death claim settlement performance of the company. But, unsettled claims include claim pending + rejected claims. Pending claims can be later settled or get rejected. So the ratio of settled claims cannot give you an accurate picture of the company. On the other hand claim-rejection ratio gives a more accurate figure on the claim settlement performance of the company and is more reliable. LIC Of India settled 98.04% of claims based on number of claims, compared to 95.24% of private companies as a whole. In terms of benefit amount it was 94.45% and 89.44% respectively. Most of the companies settled claims within a period of 3 months. LIC of India settled 45.17% of claims within 3 months and another 44.64% within 3 to 6 months. On the other hand, Kotak Mahindra took more than one year to settle 44.44% of the death claims. SBI Life also performed poorly and took more than one year to settle 38.89% of their claims. Conclusion: As the prime motive of taking an insurance policy is to get the claim amount on the occurrence of the insured unfortunate event, it is always advisable to select your insurer wisely. Claim settlement ratio must be analyzed based on the ‘number’ and ‘benefit amount’ to get a complete picture. Percentage of repudiated claims also is an important parameter to take care of. Life Insurance Corporation of India which is the only public life insurance company tops the chart and with consistent performance, remains to be the most trustworthy company in all these counts.